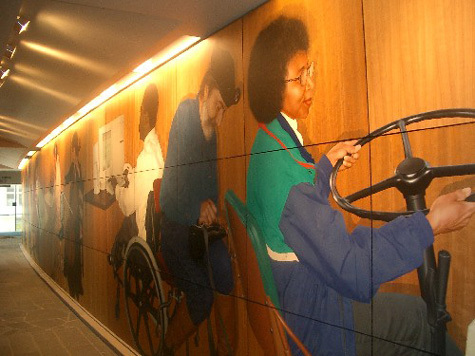 Three Sets of Twelve is a large mural commissioned by the U.S. General Services Administration for the lobby of the new federal courthouse in Seattle. Comprised of three 9-foot by 80-foot panels one above the other on a wall three stories high, the work explores the nature of the jury system by depicting twelve people in their everyday work life and as jurors in a courtroom context. Partial view of Federal Courthouse Mural, level one.